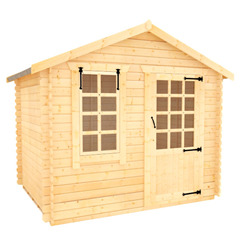 Our 19mm log cabins are manufactured to the highest quality standards and are a wonderful choice of building if you’re seeking something stylish but yet affordable. 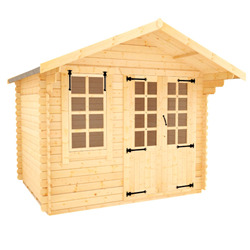 Our 19mm log cabins are a very popular choice as they look beautiful in any garden and are versatile buildings so can be used as a work space, garden room or potentially the perfect spot to fulfil a hobby. Find out more about our 19mm Log Cabins range. Looking for a beautifully designed log cabin at a budget-friendly price? 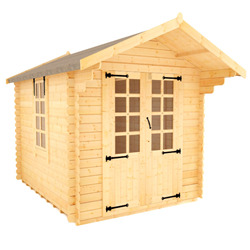 Have a look at our stylish 19mm log cabins. These buildings are more compact in size than our 28mm and 44mm buildings, but are still strong, compact and versatile, and will look stunning in any garden. Use your cabin as a garden room, as somewhere to relax and unwind in one of our custom designs made to make the most of natural light. Get in touch today to find out how you can create your own bespoke 19mm log cabin, with free delivery throughout the UK.